Myocilin antibody LS-C331563 is an unconjugated rabbit polyclonal antibody to Myocilin (MYOC) from human, mouse and rat. Validated for IHC and WB. 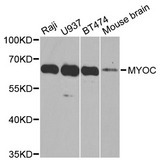 The predicted MW is 56kDa, while the observed MW by Western blot was 65kDa. 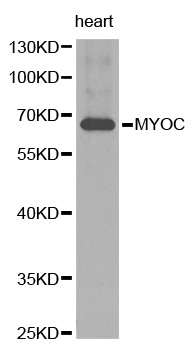 Western blot analysis of extracts of various cell lines, using MYOC antibody at 1:1000 dilution. The secondary antibody used was an HRP Goat Anti-Rabbit IgG (H+L) at 1:10000 dilution. Lysates were loaded 25ug per lane and 3% nonfat dry milk in TBST was used for blocking. 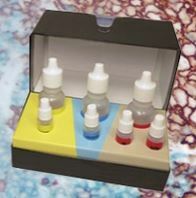 An ECL Kit was used for detection and the exposure time was 60s. Western blot analysis of extracts of human heart tissue, using MYOC antibody.